The question then becomes, did Esau behave the way he did because God hated him, or did God hate him because of the way Esau chose to behave? 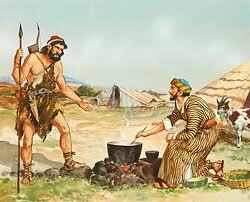 Jacob and Esau are not only individuals but they are also PEOPLE and/or NATIONS. This is important to remember in order to not read things into Romans 9 which are not stated. Romans 9 is not about individuals being elected TO BELIEVE, but it’s about a people who has sprung up from individuals, and it’s the line of Jacob which is chosen (for good reasons) to bring forth the Messiah. Most importantly it’s about a person who rejected his birthright and still expected to get it when it was time to receive the blessing. Paul made the comparison with the jews – which Romans 9 is about – who expected to inherit the Kingdom because they are born jews. We can also read from the context that God did NOT arbitrarily hate one of the twin brothers for no reason at all. There is no indication of anything good or bad about either of the children at this point. The nations arising from each will be separated, and one of these nations will be stronger than the other. The nation arising from the older of the two children will at some point end up serving the nation arising from the younger. The individual Esau never served the younger. Also note that God did not hate Esau before he was born, or while he was a child. Children are neutral and they can’t choose between good and bad. Paul says that they are not all Israel which are Israel, and by that he means that children of Abraham are those who BELIEVE like he did and who don’t live as the children of the flesh, and it was also the seed of Abraham which would bring forth the Messiah through Isaac. A person is not saved just because he is born a jew and has the law, but due to his choice to trust God and show fruit. Rom 9:6Not as though the word of God hath taken none effect. For they are not all Israel, which are of Israel: 7Neither, because they are the seed of Abraham, are they all children: but, In Isaac shall thy seed be called. 8That is, They which are the children of the flesh, these are not the children of God: but the children of the promise are counted for the seed. According to Paul, babies are neutral and can’t do either good or bad, and Paul speaks about ”election” (which is not an election ”to believe”) and highlights that the jews should not believe that the law (works) can save them since they in that case must never break one single commandment. It’s accepting the call of God that saves a person. Rom 9:11(For the children being not yet born, neither having done any good or evil, that the purpose of God according to election might stand, not of works, but of him that calleth;) 12It was said unto her, The elder shall serve the younger. Gen. 25:27 And the boys grew: and Esau was a cunning hunter, a man of the field; and Jacob was a plain man, dwelling in tents. 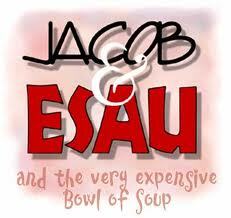 28 And Isaac loved Esau, because he did eat of his venison: but Rebekah loved Jacob. Hebrews 12 15Looking diligently lest any man fail of the grace of God; lest any root of bitterness springing up trouble you, and thereby many be defiled; 16Lest there be any fornicator, or profane person, as Esau, who for one morsel of meat sold his birthright. 17For ye know how that afterward, when he would have inherited the blessing, he was rejected: for he found no place of repentance, though he sought it carefully with tears. Obadiah 1: 8Shall I not in that day, saith the LORD, even destroy the wise men out of Edom, and understanding out of the mount of Esau? 9And thy mighty men, O Teman, shall be dismayed, to the end that every one of the mount of Esau may be cut off by slaughter. 10For thy violence against thy brother Jacob shame shall cover thee, and thou shalt be cut off for ever. Mal 1:2I have loved you, saith the LORD. Yet ye say, Wherein hast thou loved us? Was not Esau Jacob’s brother? saith the LORD: yet I loved Jacob, 3And I hated Esau, and laid his mountains and his heritage waste for the dragons of the wilderness. 4Whereas Edom saith, We are impoverished, but we will return and build the desolate places; thus saith the LORD of hosts, They shall build, but I will throw down; and they shall call them, The border of wickedness, and, The people against whom the LORD hath indignation for ever.5And your eyes shall see, and ye shall say, The LORD will be magnified from the border of Israel. Amos 6:8 The Lord GOD has sworn by himself, says the LORD the God of hosts, I abhor the excellency of Jacob, and hate his palaces: therefore will I deliver up the city with all that is in it. Thank you. So, who are the sons of Esau today? Can they be recognized? I really don’t think they can be recognised today. You clearly need more teaching of the Word. If you knew anything you would know that Jacob I love Esau I hate, if you take into consideration that he knows us before we are made flesh then he has already destined Esau AKA white people to be hated. And Esau can be recognized today, they are Edomites AKA white people or as the Bible calls you the red pale man. It would be helpful if you read the article before commenting on it. Then you would have seen that I make a point about God not hating Esau for no reason, and especially not before he was born. Esau is not only a person but also people, which I write in the article. Knowing ahead of time is not predestining ahead of time.